Thats all. 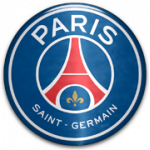 Game finished - Paris Saint Germain 7, Monaco 1. Second Half ended - Paris Saint Germain 7, Monaco 1. Offside - Monaco. Jorge with a pass, however Adama Diakhaby is in offside. Fabinho - Monaco - won a free kick in defence. Yuri - Paris Saint Germain - won a free kick in defence. Goal! Paris Saint Germain 7, Monaco 1. Julian Draxler - Paris Saint Germain - shot with right foot from the centre of the box to the left corner. Assist - Thomas Meunier. Offside - Monaco. Almamy Touré with a pass, however Rachid Ghezzal is in offside. Missed chance. Marquinhos - Paris Saint Germain - shot with the head from the centre of the box goes high. Assist - Dani Alves with a cross after corner. Corner - Paris Saint Germain. Conceded by Jemerson. Shot blocked. Christopher Nkunku - Paris Saint Germain - shot with right foot from outside the box is blocked. Assist - Javier Pastore. Corner - Paris Saint Germain. Conceded by Andrea Raggi. Substitution - Monaco. Youri Tielemans for Falcao. Yuri - Paris Saint Germain - won a free kick on the left wing. Substitution - Paris Saint Germain. Christopher Nkunku for Giovani Lo Celso. João Moutinho - Monaco - receive yellow card for a foul. Giovani Lo Celso - Paris Saint Germain - won a free kick in defence. Own Goal by Falcao, Monaco. Paris Saint Germain 6, Monaco 1. Substitution - Monaco. Adama Diakhaby for Rony Lopes. Substitution - Paris Saint Germain. Thomas Meunier for Ángel Di María. Corner - Paris Saint Germain. Conceded by Danijel Subasic. New attacking attempt. Ángel Di María - Paris Saint Germain - shot with left foot from the centre of the box is saved in the top left corner. Assist - Giovani Lo Celso. Shot blocked. Dani Alves - Paris Saint Germain - shot with right foot from the right side of the box is blocked. Assist - Ángel Di María. Missed chance. Rachid Ghezzal - Monaco - shot with left foot from outside the box goes high. Assist - Rony Lopes. Corner - Paris Saint Germain. Conceded by Almamy Touré. Substitution - Paris Saint Germain. Lass Diarra for Adrien Rabiot. Delay in match Edinson Cavani - Paris Saint Germain - - injury. Andrea Raggi - Monaco - receive yellow card. Fabinho - Monaco - receive yellow card for a foul. Edinson Cavani - Paris Saint Germain - won a free kick on the right wing. Shot blocked. Ángel Di María - Paris Saint Germain - shot with left foot inside of six yard box - left side is blocked. Assist - Julian Draxler. Goal! Paris Saint Germain 5, Monaco 1. Ángel Di María - Paris Saint Germain - shot with left foot from the centre of the box to the right corner. Assist - Javier Pastore with a through ball. Shot blocked. Falcao - Monaco - shot with right foot from outside the box is blocked. Fabinho - Monaco - won a free kick in attack. Offside - Paris Saint Germain. Dani Alves with a pass, however Edinson Cavani is in offside. New attacking attempt. Rony Lopes - Monaco - shot with left foot from the centre of the box is saved by goalkeeper in the centre of the goal. Second Half starts Paris Saint Germain 4, Monaco 1. 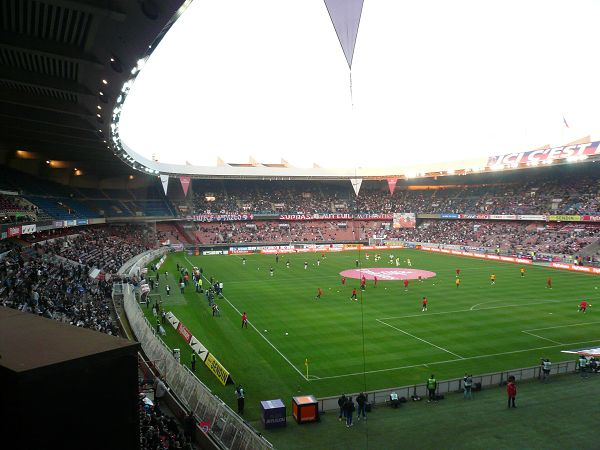 First Half ended - Paris Saint Germain 4, Monaco 1. Delay in match Dani Alves - Paris Saint Germain - - injury. Missed chance. Rony Lopes - Monaco - shot with the head from the centre of the box is high and wide to the left. Assist - Almamy Touré with a cross. Corner - Monaco. Conceded by Adrien Rabiot. Rony Lopes - Monaco - won a free kick in defence. Shot blocked. Thomas Lemar - Monaco - shot with left foot from long distance on the right is blocked. Javier Pastore - Paris Saint Germain - receive yellow card for a foul. Rachid Ghezzal - Monaco - won a free kick on the right wing. Goal! Paris Saint Germain 4, Monaco 1. Rony Lopes - Monaco - shot with left foot from few metres to the centre of the goal. Assist - Almamy Touré. Substitution - Monaco. Rachid Ghezzal for Djibril Sidibe - injury. Offside - Paris Saint Germain. Thiago Silva with a pass, however Yuri is in offside. Delay in match Djibril Sidibe - Monaco - - injury. Missed chance. João Moutinho - Monaco - shot with right foot from outside the box missed to the left. Assist - Jorge. Goal! Paris Saint Germain 4, Monaco 0. Giovani Lo Celso - Paris Saint Germain - shot with the head from the centre of the box to the left corner. Assist - Javier Pastore with a cross. Shot blocked. Falcao - Monaco - shot with left foot from outside the box is blocked. Assist - Almamy Touré. Shot blocked. Rony Lopes - Monaco - shot with left foot from outside the box is blocked. Corner - Monaco. Conceded by Edinson Cavani. Goal! Paris Saint Germain 3, Monaco 0. Ángel Di María - Paris Saint Germain - shot with left foot from outside the box to the centre of the goal. Assist - Edinson Cavani with a through ball following a fast break. Thomas Lemar - Monaco - won a free kick in attack. Offside - Paris Saint Germain. Giovani Lo Celso with a pass, however Edinson Cavani is in offside. Goal! Paris Saint Germain 2, Monaco 0. Edinson Cavani - Paris Saint Germain - shot with the head from the centre of the box to the left corner. Assist - Yuri with a cross. Goal! Paris Saint Germain 1, Monaco 0. Giovani Lo Celso - Paris Saint Germain - shot with left foot from few metres to the centre of the goal. Assist - Dani Alves. Missed chance. Falcao - Monaco - shot with the head from the centre of the box missed. Assist - Thomas Lemar with a cross. Missed chance. Edinson Cavani - Paris Saint Germain - shot with left foot from the centre of the box is close, but missed. Falcao - Monaco - won a free kick on the right wing.